Charnley Services can supply and fit bespoke joinery made to extremely high standards. We have experience in recreating exact copies of windows, doors, skirting, and architraves. In many cases these have been found to be beyond economical repair, or may even have been removed from a building altogether. 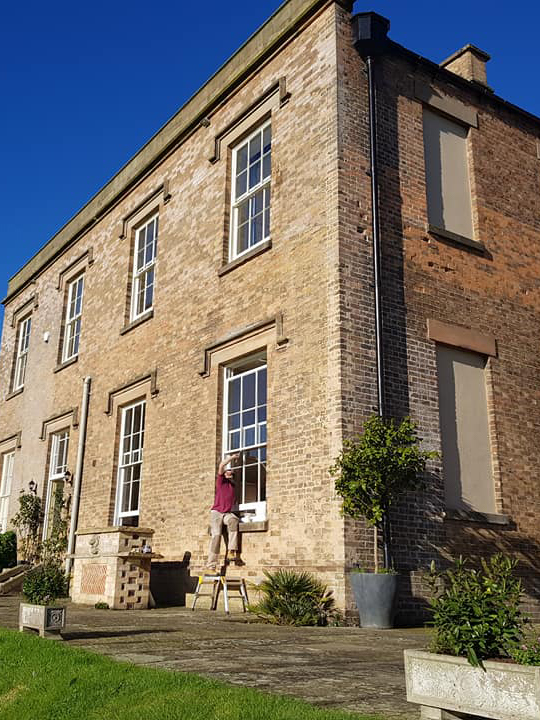 Where windows and doors are being re-created, we can offer the opportunity to increase security, glass strength and draught-proofing whilst retaining the original character of the building. This is the ideal route for graded listed buildings where we find that ‘like for like’ replacement is the only permissible option. Please get in touch for our friendly advice and a free no-obligation quotation and survey. Perhaps one of the most important aspects of traditional windows is that they were not designed to withstand today’s world. Original fixings are often not strong enough anymore and we often see windows that leave properties vulnerable. Charnley Sash Windows have also been called back to a customer's home to tidy up where the thieves could not get past our security installations. In this instance we had installed security toughened glass, Brighton fastener locks, and lifting restrictors as a secondary means of security. You can never 100% secure your home, but there is a lot we can do. Charnley Sash Windows use high quality locks and fittings, these not only provide higher levels of security, but also act as a clear and visible deterrent to the opportunist. We can also install much tougher glass, even 6mm laminated security glass, but more often than not customers benefit from our discounted security and convenience pack. This not only includes a high quality brighton sprung fastener, but also matching sash restrictors (removable stops), and lifting handles. All available in different variations and finishes to match your home. These not only add security and a deterrent to thieves, but also leave the window visually complete internally and as they were designed to be seen. Charnley Sash Window Security Pack. This includes 1 x Brighton Fastener, 2 x Lifter hooks (bottom window), 2 x Sash Restrictor Bolts. This makes a good comprehensive security package for any sash window, with the added security of child friendly removable restrictors that limit the travel of both the upper and lower sash over a shared opening distance. High quality solid fixings a large range of styles is available. Our most common lock is the Brighton Fastener, spring loaded its easy to check at a glance if a locks un-secured as they stand up. When locked they pull the meeting rails together complimenting our 10-point Draught-Proofing system, whilst ensuring a secure and tamper-proof window from the exterior. 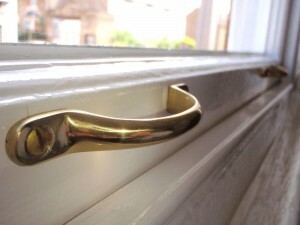 Fitted to the bottom rail of your lower sash internally, lifters serve as an easy and safe way to operate your windows. They also have the added benefit of reducing the stresses and strains that can often damage windows during opening and closing using component parts of the window. These are also available as matching D-handles to be attached to the underside of the upper window externally. With the added bonus of making your windows look smarter and keeping hands away from clean glass and paint finishes making these a popular choice. We fit restrictors discretely up the sides of the upper sash internally. Our customers are motivated by a number of incentives to fit these. 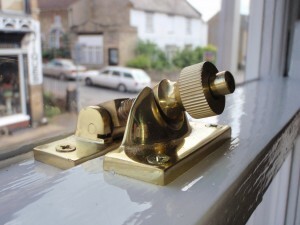 First and foremost is to allow a sash window to be left part open for ventilation without compromising on security. Another aspect is that when windows are shut and locked these restrictors form another layer of security if the window has been forced. Sash Restrictors also make a window secure from the inside should you wish to limit the movement for safety reasons such as a first Storey infant’s room. All our restrictors are carefully fitted and come with a pair of basic removal keys per window. Please let us know if you think you have any salvage you feel may be of interest to us. We believe that there is no greener option than 100% recycling of valuable parts of traditional homes. Our comprehensive service list demonstrates our capability in managing a project from start to finsh with little to no input from external companies. 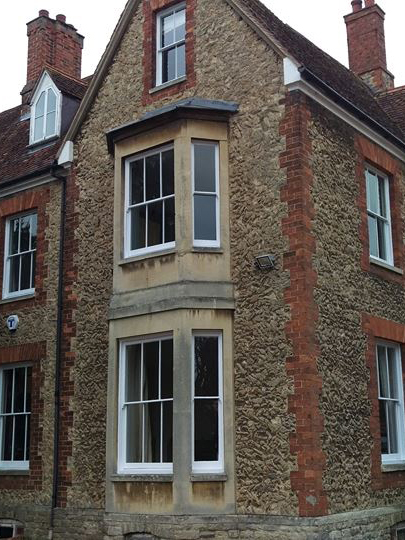 We pride ourselves in being excellent craftsmen, not just a sash windows service. 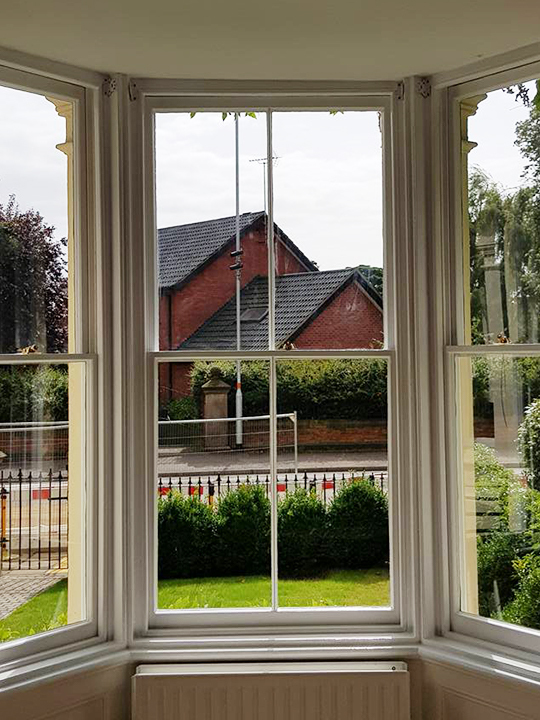 Although sash windows are certainly our core speciality, offering a total sash window service means being proficient at building, joinery and carpentry too. Feel free to give us a call to arrange a free site visit and free quotation.